Custom wedding save the date invitation. 2" x 2" square magnet. 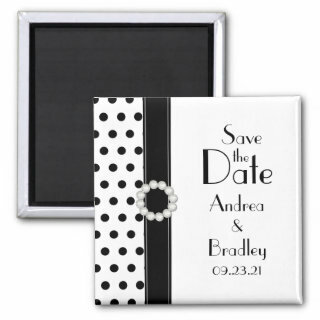 Zazzle custom magnets come in square and round shapes (with three different sizes for the round magnets). Designs are printed in full color and look beautiful and vibrant. They have a high gloss finish. It's easy to personalize the text and photos with your own. Both square and round magnets available. Multiple sizes available for round magnets (1.25", 2.25", & 3"). Prices vary with style and size chosen. Choose between round and square shape. Note, not all designs switch properly between square and round shapes. Zazzle's website is "what you see is what you get", so make sure you are pleased with what the product looks like prior to ordering.